After a pretty quiet Sunday night we woke on Monday morning to Hayley bouncing around with excitement at the prospect of us all going to see Coheed & Cambria that evening. It’s not exactly a band the i would say is my sort of thing but hey ho, it was one of the main reasons she wanted to come to Boston so it was only fair. A good thing about this was that the Fed-Ex office that we had to collect the tickets from was right next to Chinatown so it seemed only logical to head down there for lunch. Mark had Monday and Tuesday off so he was with us and acting as our food guide. We arrived in Chinatown and headed straight for the Gourmet Dumpling House, as soon as we walked in I knew it was going to be good, everyone in there apart from us was Asian and barely anyone was speaking English. That is precisely what i want when i walk into a restaurant, if it’s full of people coming here to get a taste of their homeland then that’s what i want too. I also love it when you automatically get presented with a seemingly never-ending pot of green tea, it makes you feel so cleansed and this was especially needed after a lot of eating and drinking over the past few days. 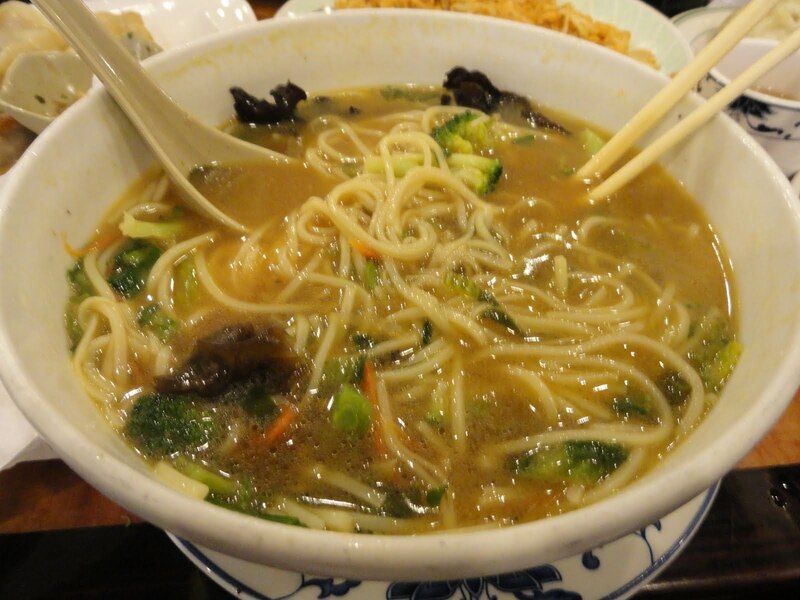 Somewhat foolishly we sat back and let the boys order the dumplings, I busied myself with ordering a big bowl of vegetable noodle soup (see what i mean about feeling the need to cleanse?) 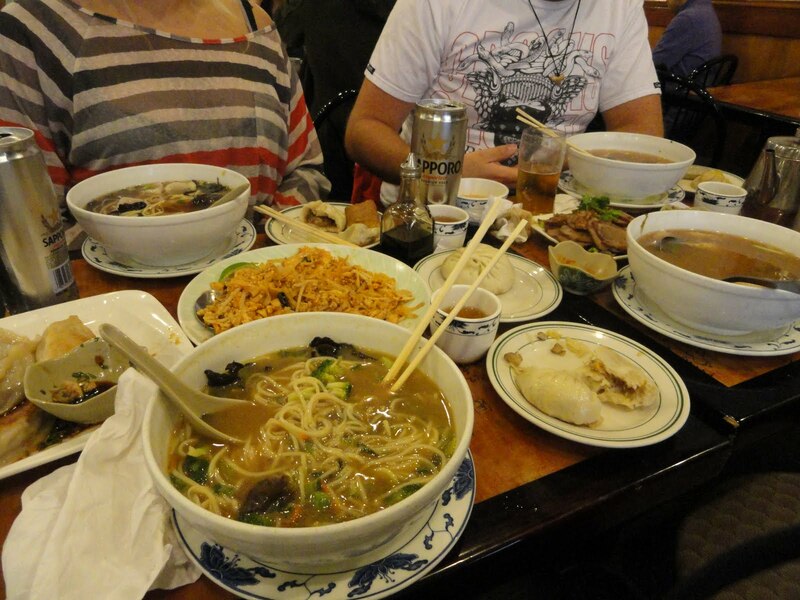 and wasn’t quite prepared for the amount of food that arrived. After this we spent a very amusing weekend nosing around Chinatown, originally this was in search sour tamarind – a major ingredient in a traditional Pad Thai, but after we couldn’t find it we just ambled happily around the backstreets. Obviously we didn’t leave empty handed, food wise we came out with our little mitts full of dumpling wrappers, rock candy, uncooked prawn crackers, they’re little discs that you chuck in bubbling hot oil and it crisps and puffs and bends and crackles- i can’t wait, and those cute little koala and panda shaped biscuits filled with chocolate. We also got some non foodie trinkets, boston t-shirts, pretty painted chopsticks, hideous sunglasses for me and hayley to wear on our birthday (we’re both born on the 12th may) and firecrackers. All in all it was pretty amusing, all of us wandering around like little kids. After this we headed to Anchovies for drinks and some fried mozzarella (whoever thought of this deserves some kind of medal) before heading to the concert. Here we (I) consumed many a vodka, soda and lime and danced our little socks off (well, hayley and mark did) before heading back to anchovies around midnight for pulled pork and spinach lasagna. This is something i’ll going to attempt to make myself before too long so keep checking back because if i even get close, you’ll want to eat this, i promise you. The next day i was severely under the weather (i think we all know what that means), not feeling even slightly tempted by food until the evening. Luckily the day’s first foray into food was a massive success, being one of the best meals we had the whole time we were in Boston. No one felt like venturing too far and as it was a nice, if chilly, evening we decided to walk to Picco on Tremont St. I’m so glad we did, we had about a half hour wait so we just sat at the buzzing bar and had a drink whilst we waited. It’s got a great atmosphere and we were surprised to find it so busy for 9pm on a tuesday, a good sign. It is also the kind of place where there was a young couple sat next to a family, sat next to a big group of friends and everyone looking perfectly relaxed and content. We sat down and started off with half an order of the ravioli of the day, ricotta and pea with a lemon thyme butter, which was utterly divine and i’m chomping at the bit to recreate. I feel it won’t be long. 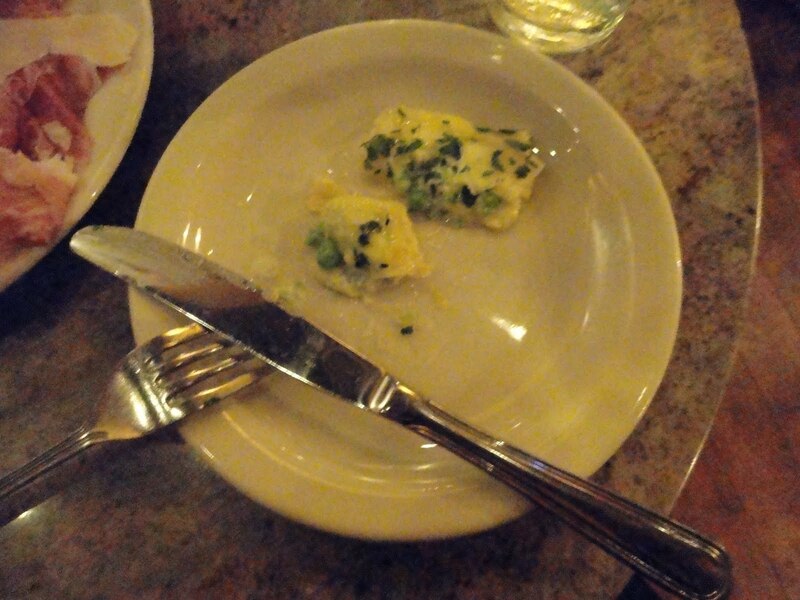 Silky smooth pasta, filled with creamy ricotta and raw little peas made the whole dish light and fresh. A great way to kick things off. 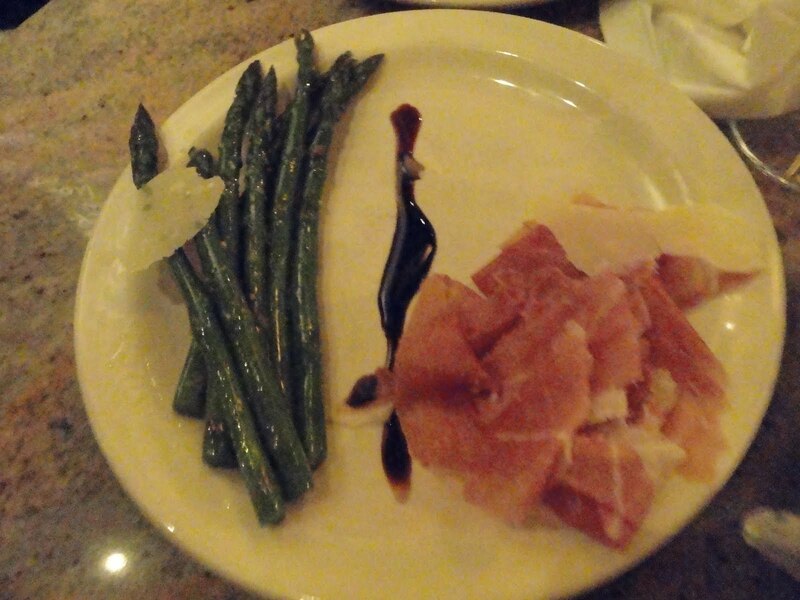 As was the plate of grilled asparagus and Prosciutto with Parmigiano Reggiano and balsamic vinegar. The saltiness of the parmesan perfectly complementing the sweetness of the prosciutto and the earthiness of the asparagus, the kind of starter i could and will eat all summer long, something that really just lets the ingredients shine. After this we shared a couple of pastas between us, one, a Spaghetti Aglio e Olio- in house made semolina spaghetti with garlic, olive oil, chicken broth, butter, red pepper flakes & Parmigiano Reggiano. Simple stuff but it came together to make something really quite special, especially as the pasta was perfectly al dente. Overcooked pasta is capable of really ruining a dish for me, luckily that was not the case with either one. Secondly, and partly because i have completely rediscovered my addiction to it over recent months is Macaroni Cheese. 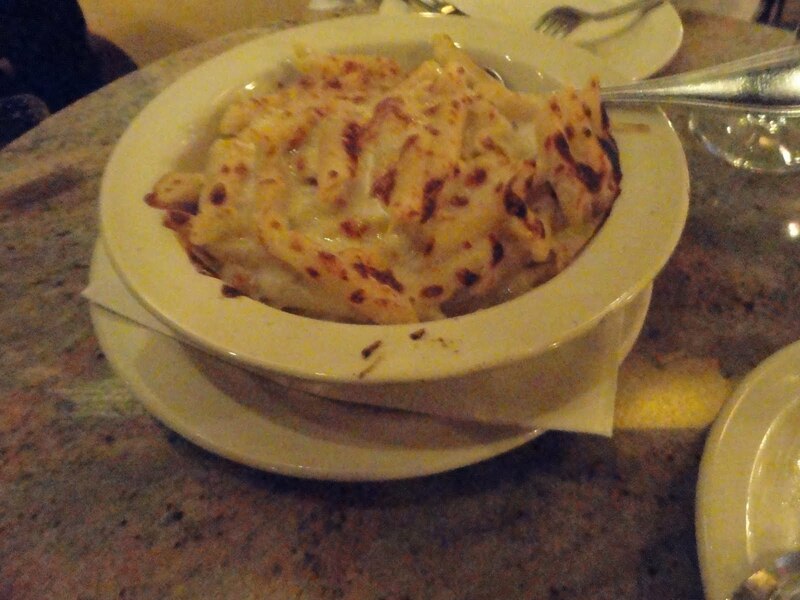 This one was made with a blend of five cheeses – aged cheddar, gruyere, provolone, gorgonzola & taleggio and penne. Now this was what i call macaroni cheese. This is how it should be. Firstly this is basically a list of my favourite cheeses and the combination melted together formed what can only be described as a hug in a bowl. 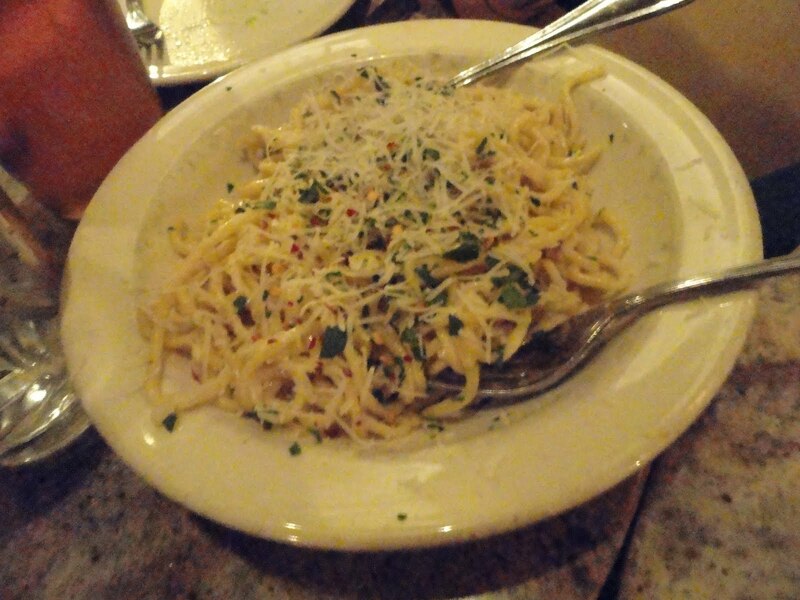 Warming and savory and utterly divine. Especially after i sprinkled some chilli flakes on mine. A bit of blue cheese makes the world of difference to a macaroni cheese in my opinion, it elevates it, makes it deeper and more satisfying, you’ll be getting a recipe for this soon too. And then we rolled straight on in to the pizzas. You can choose either a small or a large, we went for smalls given that we’d ordered pastas too (and, let’s not kid ourselves, we wanted room for dessert). It’s a great idea as it means you can sample a couple instead of everyone having to compromise on just the one choice. Are you getting the idea that this is how i like to eat? I get serious cases of food envy if someone elses looks better than mine so for me, lots of things to share is the perfect way to go. The other one we went for is a sure-fire winner in my eyes, pizza with organic rocket and prosciutto, especially after we’d tasted the prosciutto earlier. I wasn’t disappointed. 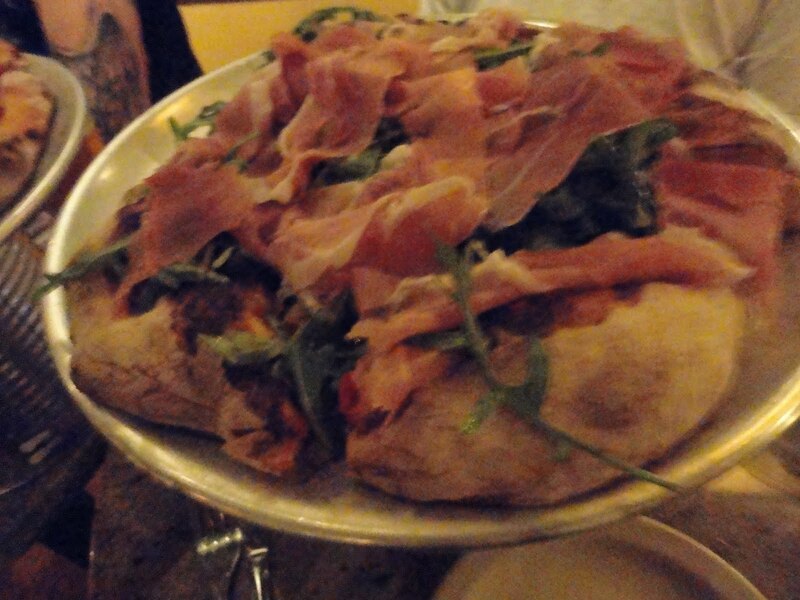 It had the same super crispy crust and thick rich tomato sauce and mozzarella, flawlessly cut through by the freshness of the rocket and then topped with delicate sweet ham. Surprisingly enough, we were pretty full after this indulgent spread of food, so obviously we decided we were full and called it a day. Or maybe not. I often claim not to have a very sweet tooth which obviously everyone finds bizarre given that i’m a pastry chef but often i’d rather have cheese. It’s my drug of choice. Although, the longer i spend around desserts, creating new things, the more i find myself craving them. Today was a different matter however. I wanted dessert, big time. Luckily everyone was with me on this one, and thank god. Hayls and I shared the best chocolate brownie i have ever eaten in my life, topped with chocolate sauce, whipped cream and the most scrummy caramel swirl ice cream (yeah, we didn’t exactly get a little dainty dessert). It was sinfully good, dense, sumptuous and we just kept going and going until every last luxurious mouthful was gone. The boys went for the sampler plate of 3 different ice creams, chocolate sorbet, coffee ice cream and cinnamon ice cream. They were awesome as well. The chocolate sorbet was declared by Alex as the best he’s ever tasted and we had to sweetly ask the waitress for the recipe. Now that’s another great thing, they said yes, without a second’s hesitation. The sous chef wasn’t there on that night so we have the recipes for the brownie, caramel swirl ice cream and dark chocolate sorbet being emailed to us. I’ve been obsessively making Alex check his e-mail to see if they’ve arrived, i can’t wait to whip those up. As you can probably tell, seeing as i’ve ranted and raved and salivated my whole way through talking about Picco, I can’t recommend it highly enough. 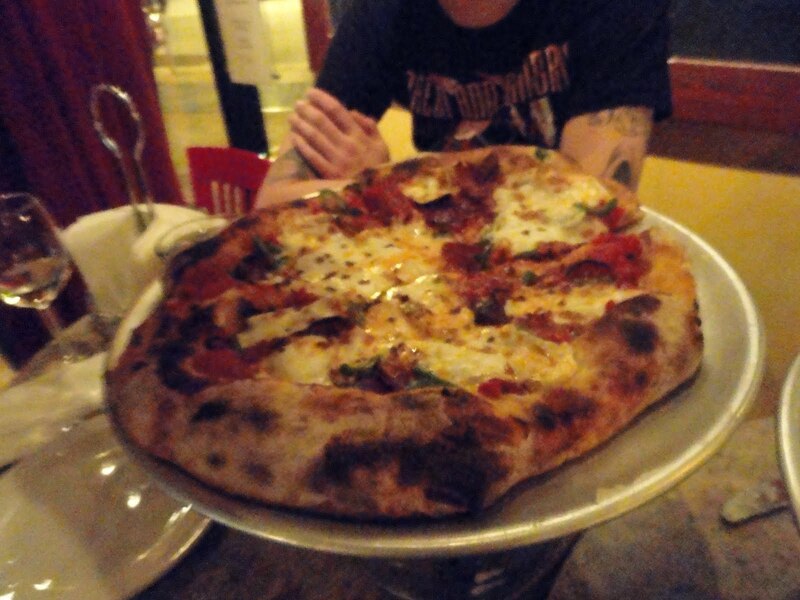 If you live near, go now, it’s the best little neighbourhood pizzeria you could hope for. And i’m jealous that it’s not mine. Before we knew it, it was wednesday morning and time to fly home, we couldn’t leave without some lunch though could we? Nope. We got up and shoved and crammed our stuff in suitcases as fast as we could, showered and dressed in record time and were ready to roll. We wanted some cute pj bums we’d seen a few days before so me and hayley hightailed it up the road to buy them. When we got back we realised we would indeed have time to make it to Toro for a super speedy lunch before we had to head to the airport so we threw our enormous bags into a cab and got dropped off there, arranging to be picked up again in an hour. 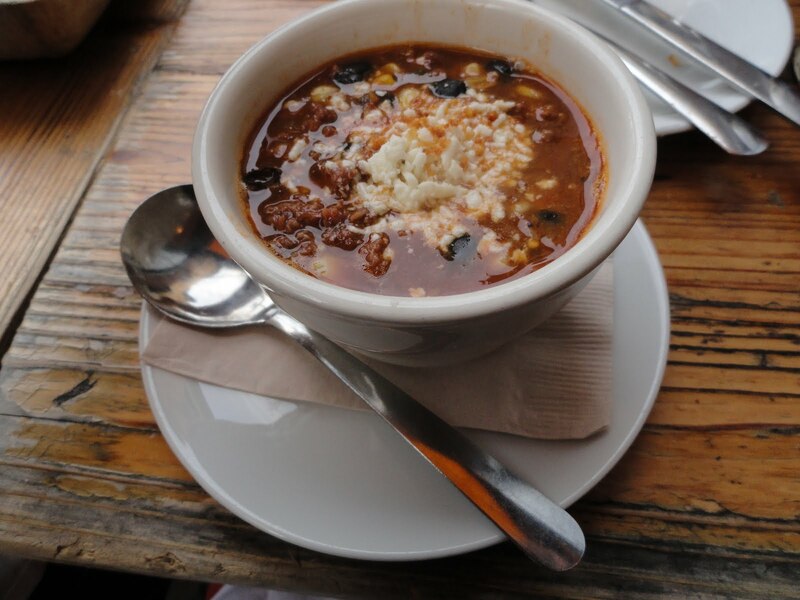 We were planning on just having the bread to tide us over before a famous Toro burger but we caved when we learned that the soup of the day was black bean and chorizo. It was worth the cave and came in wonderfully portioned little pots. Smoky and deep and pretty irresistible. Whilst we were waiting for our burger Mark sent out a little surprise. Honestly, when it first came out, i wished he hadn’t. 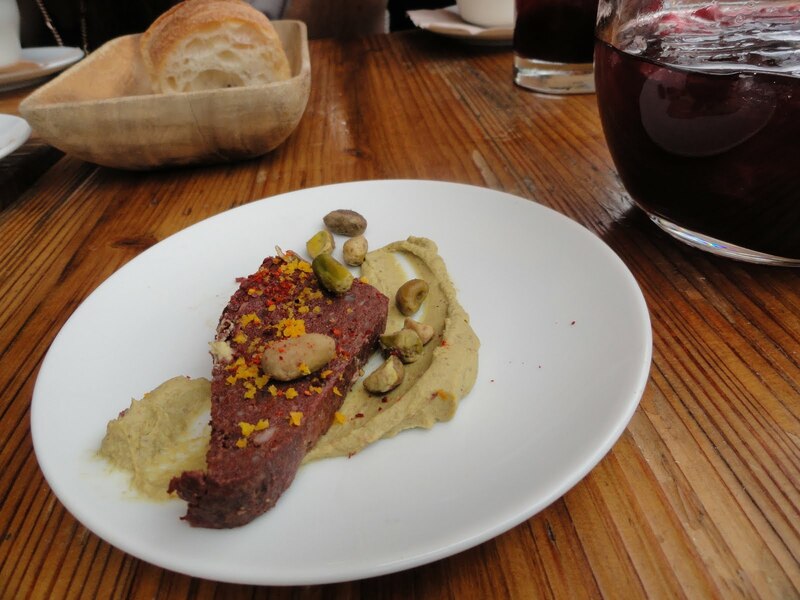 Pate soaked in blood on a pistachio puree. That just wasn’t something i thought i could do. The idea of pate in blood is just not appealing, however, after making Alex and Hayley try it first, to unanimous praise, i relented and deigned to try some. And damn it, it was pretty good, i think if i didn’t know what it was i would have inhaled it, so if you can get past the idea of then try it, it’s yummy. At least it looks prettier than it sounds! Then it was down to the last one. 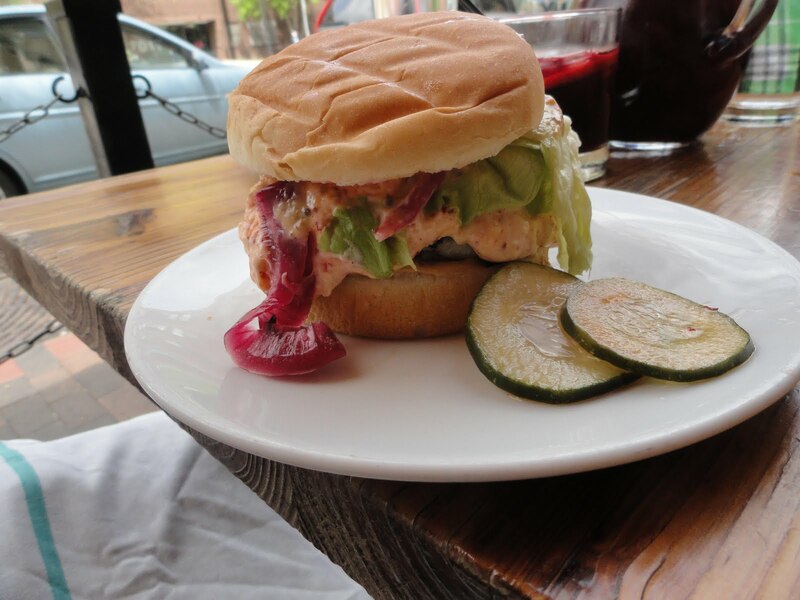 The burger is cooked to medium and then smothered in the delicious cheesy aioli that usually sits atop the corn, with pickled red onions, caramelised onions and lettuce. I have to say, for me it’s a little rich. I love the two different types of onions with it but it’s not enough to cut through. The burger itself is so rich that once it’s topped with the sauce it gets a little over whelming, and i SO love it on the corn. I think if they did these in slider size they’d be perfect as half was more than enough for me. And so it ends. 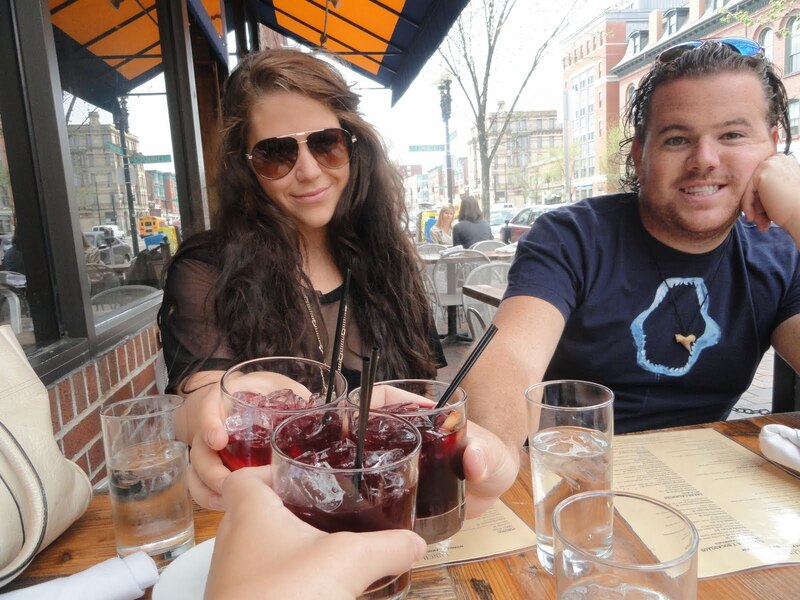 Our foodie trip to Boston is over and we head back to Nassau, happy and full and already dreaming of all the amazing food we’ve had. It’s a great city with some very talented chefs doing some really pioneering things with food, as well as those just doing the classics superbly, what a great mix of traditional and modern. 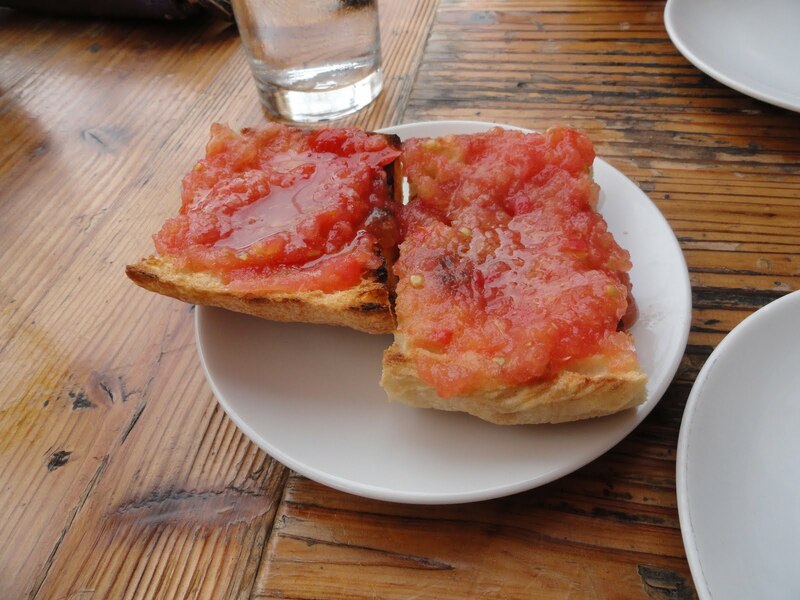 If you’re looking for your next foodie escape, i think you might have just found it.